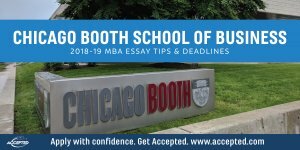 Chicago Booth, which has never shied away from change, has changed its MBA application essays almost entirely this year. • Booth went from one required essay with a visual presentation option to two required essays. • There is no visual component to Booth’s application this year. After pioneering the visual element roughly ten years ago and having you choose from several pictures for the last two years the “moment” that most resonated with you, Booth’s app this year is entirely written. Booth may, however, invite waitlisted applicants to submit a video. • The two required questions have 250-word minimums. While specifying MBA essay length minimums is very unusual, it fits with Booth’s history of breaking the mold. At the same time, don’t infer that the absence of a maximum is a license for verbosity. As Booth says, “We trust that you will use your best judgment in determining how long your submission should be.” Do use your best judgement, otherwise you will be showing a different kind of judgement, and you really don’t want to do that. • The optional question this year is more restrictive than in years past. • The reapplicant question is unchanged. While most prompts have changed, the intent of these questions is the same: to get to know you, see how you think, and to see how you will fit into Booth’s community. 1. Your immediate post-MBA goal, which you should be able to define in terms of function (what you want to do after you earn your MBA — not study during the MBA) and industry or type of company. Sometimes location can play a role, and if so, provide that information, too. 2. Your longer-term professional aspirations. These don’t have to be as specific as your short-term goal, but the two should be related. 3. The Chicago Booth program. Specifically how do you intend to use distinctive Booth strengths to build on your past and prepare yourself for your chosen career? If it’s not obvious how your previous education and experience when combined with the Booth MBA will help you achieve both goals, clarify. To answer the question, you can start with a seminal experience, preferably an achievement that shaped your goals and aspirations. Tell a story about this experience and describe what you learned from it and how it has influenced you and your short- and long-term goals. Then talk about Booth. Look at the curriculum, strengths, career placement, and extra-curricular activities that support your ambitions. Alternatively, start with the achievement of your goal — a day-in-the-life approach — then flash back and tell the story of that seminal experience and how it and Booth prepared you for the future day that started your essay. Last week I attended the AIGAC conference, which Chicago Booth hosted for one morning. During the informative sessions at Booth, the admissions committee members made clear that they are looking for students who demonstrate self-awareness and direction. They want to read your application and see, based on what you’ve done, that you’re going to make a mark on the world. Write this essay so that it shows both self-awareness and your ability to make that mark. Choose 1-3 important decisions that you’ve made, ones where the outcome was anything but certain, you had lots of options, and there was no obvious right way or clear winner among the options. Think of a fork in the road with many pathways leading from it. You were then in a choice-rich environment, like the one that Booth will provide. What “interests, leadership experiences, and other passions” influenced your choices? Is there a common thread to your decision-making process that will tie together these decisions, as well as your essay? An excellent response to this essay has to show the self-awareness that I heard about last week as well as a clear sense of priorities. The ability to prioritize will be vital to anyone accepted to Chicago Booth’s MBA program. • Length: There is no maximum length, only a 250 word minimum. We trust that you will use your best judgment in determining how long your submission should be, but we recommend that you think strategically about how to best allocate the space. • Acceptable Formats: Use the text box provided in the application or upload a Word document. This is a restrictive optional question. Booth is really asking only for information that will clarify something that is unclear, like a drop in grades one semester or a period of unemployment, or why your current supervisor is not writing your letter of recommendation.. This question, unlike the required questions, does have a word limit. Respect it. The answer to this question is critical for MBA reapplicants, and it’s different from most reapplication essays in that it’s more about your perspective than what you’ve done. Chicago wants to see growth and development. Same old, same old got you a ding last time and probably will again this time. Let this brief essay show a maturation and evolution of your goals and reasons for wanting to attend Chicago Booth. Let it also reveal that you meet Chicago’s criteria better this year than last. For expert guidance with your Chicago Booth MBA application, check out Accepted’s MBA Application Packages, which include comprehensive guidance from an experienced admissions consultant. We’ve helped hundreds of applicants get accepted to Chicago Booth’s MBA program and look forward to helping you too! Last updated on July 2, 2018.